Just like the PC10420 Series of Network Interface Modules (NIMs), the PC10422 Series enables ARCNET connectivity for PC/104 compatible computers. However, this series is designed with the more advanced ARCNET controller chip which is the COM20022. The COM20022 controller chip has benefits such as command chaining, sequential access to internal RAM, and duplicate node ID detection. Bus contention problems are decreased since the module only requires an I/O address. There is no requirement for wait-state arbitration. 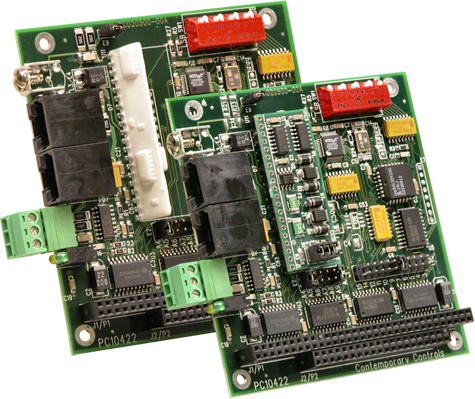 The +5 V only operation reduces system cost by eliminating multiple-voltage power sources. Two LEDs on the module's board monitor network operation and bus access to the module. The PC10422 is equipped with an eight-position, general-purpose DIP switch used to assign the ARCNET node address without removing the module. The node address can be configured via software-in which case the DIP switch could register user-defined functions such as data rate, cable interface, or master/slave status of the PC/104 system. The PC10422 is available with flexible cabling options. The PC10422-CXS supports coaxial star configurations requiring external active or passive hubs. This series also accommodates three separate EIA-485 physical-layer implementations. The PC10422-485D supports the EIA-485 DC-coupled cabling standard. Certain applications require that the COM20022 be operated in backplane mode. The PC10422-4000 is intended for these applications and supports the transformer-coupled EIA-485 physical-layer interface. All EIA-485 models are fitted with dual RJ-11s and a three-position screw terminal connector to ease field wiring.